One bus stop on an island like this is common enough, but I'd like to find examples of the situation above, where two intersecting bus lines stop on the same island — one nearside, the other farside — so that the island becomes a very easy transfer point, at least if you're travelling (in this drawing) between points west and points south, or between points east and points north. If you've seen this arrangement, please leave a comment! Thanks! The image below, of Sydney's M2 freeway at Barclay Road, shows the two directions of a median busway crossing over each other so that buses can stop on a center platform — without the buses needing to have doors on both sides. Another I'm familiar with is on the Los Angeles Harbor Transitway at I-105. The station is buried under a freeway interchange but the crossovers on the north-south busway are clearly visible. Can anyone identify other examples of this design in busways anywhere in the world? Please reply in comments if so. Thanks! re-entering the freeway continuing in the same direction. We'd especially like to see examples where the intersecting local street has its own bus route flowing through, and people can connect to the freeway service here. This provides good examples of stop placement and resolutions of the conflict between pedestrian and car needs in this context. If you can think of an example, please just comment with the city and the names of the intersecting roads. I'll take it from there. dissent of the week: should minimum walking distance be measured round trip? Last week I posted on the odd phenomenon of one-way splits, where the two directions of transit service are moved some distance apart. My point was that it's a great example of symbolic transit, in that the lines appear to cover more area, in a way that looks nice to developers, but they actually cover less, if you define "cover" as "being within walking distance of both directions of service." If we assume an acceptable walk to be, say, 400m, then as you can see in the diagram below, the area within walking distance of both directions of service (blue in these diagrams) shrinks as the separation gets larger. Most commenters agreed, but there was an interesting dissent. The post is misleading. It makes more sense to calculate the round-trip walking distance, in which case the areas covered in blue would be the same. I have to admit I had never heard this definition of coverage before. It implies that if we have to walk 800m to the bus in the morning but 0m to return in the afternoon, we're within a acceptable 400m walk. If you're a talented illustrator who's willing to volunteer a few hours in return for a possible publication credit, read on. My book Human Transit, which I hope will come out by November, needs some ideas for a cover. The publisher has developed one that has promise but would like to see some alternatives. Cool! Minimalist, not emotional, not "hot"
Transit can be simple. The image must not convey a sense of complexity or confusion. That's why I'm thinking "minimalist." 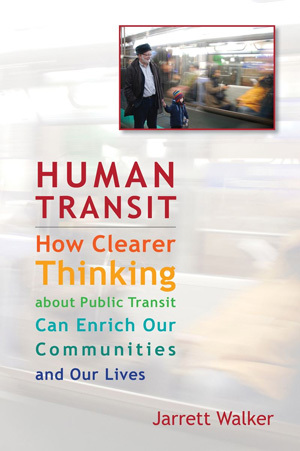 Transit is about humans, their needs and desires, their joy and success, their jobs and families and recreation. Transit is not about technology choice. That's why I tend to prefer images that are based on transit map imagery rather than images of transit vehicles. All this text must be clearly legible on the cover, though the subtitle should be smaller than the rest. The cover dimensions are 6×9 inches. If you provide the image that becomes the basis for the selected cover, you'll be credited on the title page. Please note, however, that I'm not running a contest, just welcoming ideas from anyone who wants to share them. The final decision about the cover will be made by the publisher. Please pass this on to graphic artists, or aspiring talented ones, that you know! I would need to see your ideas by July 20 to keep the project moving.